‘The Walking Dead’ Graphic Season 7 Trailer Released And It Might Reveal Who Negan Kills! Every “Walking Dead” fan is screaming right now. AMC has gone and dropped a HUGE teaser trailer for season 7! It may shed new light on who Negan killed during the cliffhanger that still has everyone guessing! 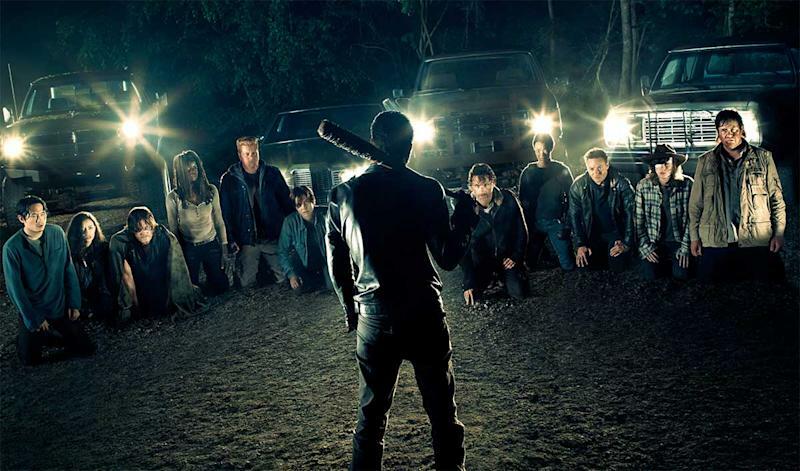 Rick, being Rick and all, threatens Negan right off the bat — pun intended. He tells Negan that he will kill him. Maybe not right now, or maybe not tomorrow, but he will kill him. To that, Negan responds with a speech about right hands and how you can’t do without them. Does he refer to a person that he just killed? Daryl, Michonne and Maggie were all sitting on Rick’s right side, and any of them could be considered to be a worthy right hand. One eagled eye fan saw one other detail in the clip, a ring sitting in a pool of fresh blood on the ground. That appears to be Maggie’s ring. Remember the plausible theory that said Maggie and not Glenn is going to be killed? Well, this clip seems to confirm it. But that’s not everything that’s being teased here. Negan is so annoyed with Rick that he’s determined to punish him in one way or another. Fans of the comics will probably think that Negan will chop off his right hand, but Gizmodo rightly points out that might not happen. It should be pretty clear by now that the TV series and comics will not be identical. And that means Rick doesn’t have to lose his hand. Part of the reasoning behind this decision is related to the financial costs involved with the special effects required to show Rick without a hand. That doesn’t mean it’s completely out of the questions for the showrunners, of course. Just that it’s improbable. At the same time, we’ll point out that the clip’s purpose might be to mislead us into thinking we’ve got things figured out. If there’s one thing that’s absolutely obvious is that Negan is playing a whole different game than any earlier Walking Dead villains. Just look at his bat after that atrocious kill.